When the Veterans Benefits Administration (VBA) sought to procure Personal Identifiable Information (PII) File Conversion and File Relocation Services, they selected Southwest Solutions Group’s Information Management Solutions (IMS) Division to standardize and index their records. The VBA, along with multiple other government agencies, were relocating their records to a new facility with a centralized location. IMS staff and leaders were required to undergo a high-level security clearance including fingerprint and background investigation by the GSA security personnel. The VBA project consisted of VBA standardization of their existing record indexing system to conform to other VBA offices around the country. Existing VBA files were spread throughout several departments with multiple document volumes separated from their original files. 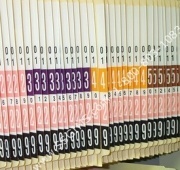 These documents had to be brought together, indexed, and then relocated into a centralized high density file shelving system at the new location. Weekly coordination meetings were held to administer and adjust the scope of the conversion project and meet the requirements of VBA. The IMS team developed a barcode tracking system to barcode and track PII documents and 3000 boxes of documents from various points throughout the building (including vehicles). This allowed the team to convert records throughout several areas of the building while still maintaining complete audit and tracking controls. “The VBA project was completed on time and a 100% reconciliation report was provided to the client, assuring them that all PII documents had been safely and securely transported to their final destination. The VBA later stated that they chose Southwest Solutions Group IMS Division for the file conversion project because they were confident the project would get done right, and on time. 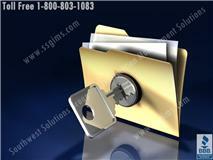 To see a complete list of our products and services, please visit www.ssgims.com.